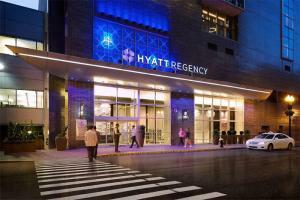 The Hyatt Regency Boston is an elegant hotel in the middle of the one of the nation's most historic cities. Catch a baseball game, explore the Harbor or simply sip a cocktail at the on-site restaurant and lounge. The hotel offers a wide variety of accommodation options from pet-friendly rooms to lavish suites. Enjoy a modern dining experience with locally-sourced ingredients at Avenue One and refreshing drinks at the Lobby Bar. The hotel also features an indoor pool and a fitness center to help you stay on top of your workout routine. Logan International Airport is 5 miles from the hotel, and Boston South Station is a short walk away.